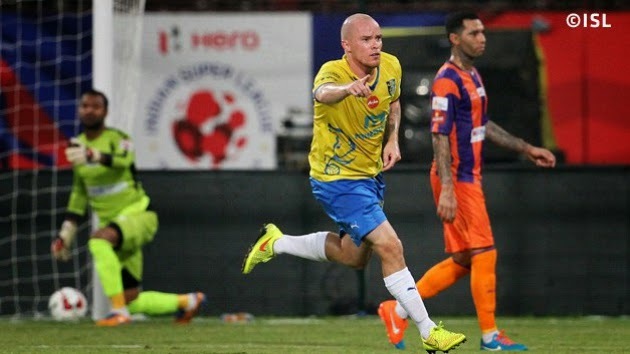 Iain Hume’s superb 23rd minute strike from a free kick helped Kerala Blasters FC to edge past FC Pune City and enter the semi-finals of the inaugural edition of the Hero Indian Super League with a nervy 1-0 victory. The home side were on the back foot for major periods of the game as the visitors played with more attacking intent. Kerala survived a scare early on when Jermaine Pennant received the ball on the left and drilled a low cross across the box which evaded the defence and Dudu Omagbemi who failed to tap it in. However, Kerala went ahead when Hume stepped up to take a free kick on the right and curled it brilliantly past the wall and goalkeeper Arindam Bhattacharya for what would prove to be the matchwinner.